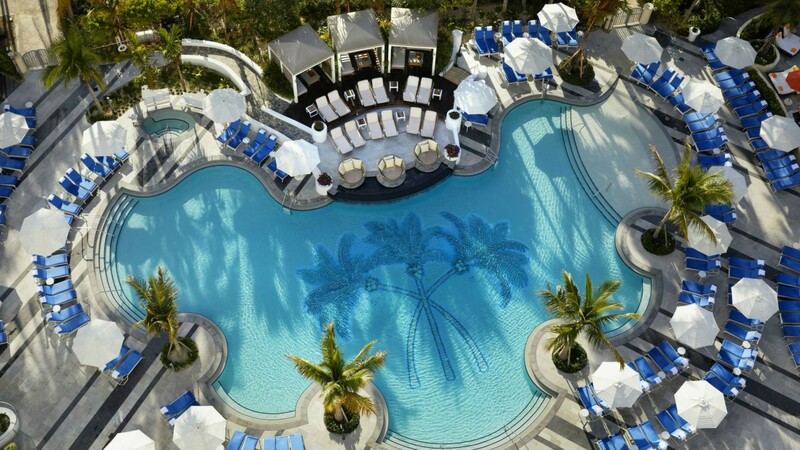 Beautiful design, plentiful dining options, poolside cabanas and direct beach access give Loews Miami Beach Hotel the feel of a luxury resort. 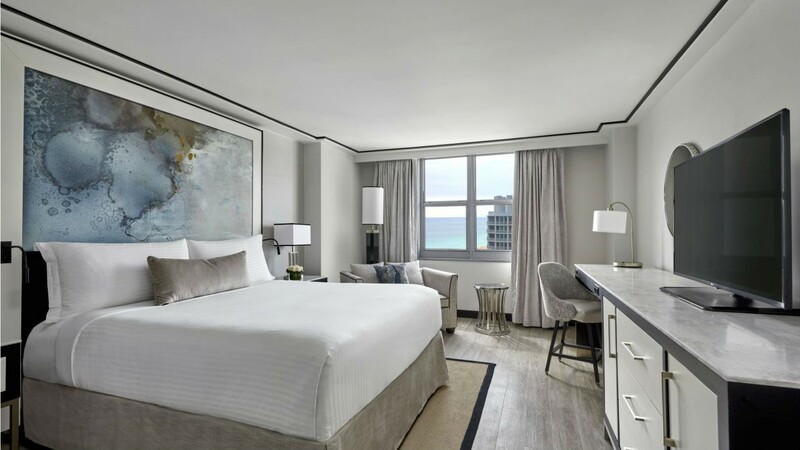 After a recently completed $50 million renovation, every inch of Loews Miami Beach Hotel is a sight for sore eyes. Numerous dining options, poolside cabanas, beach access and swaying palm trees make this luxury hotel feel more like a top-tier resort. Instagramable photo ops are around every corner, from the sunny outdoor terraces to the palm tree and fountain-lined walkway. 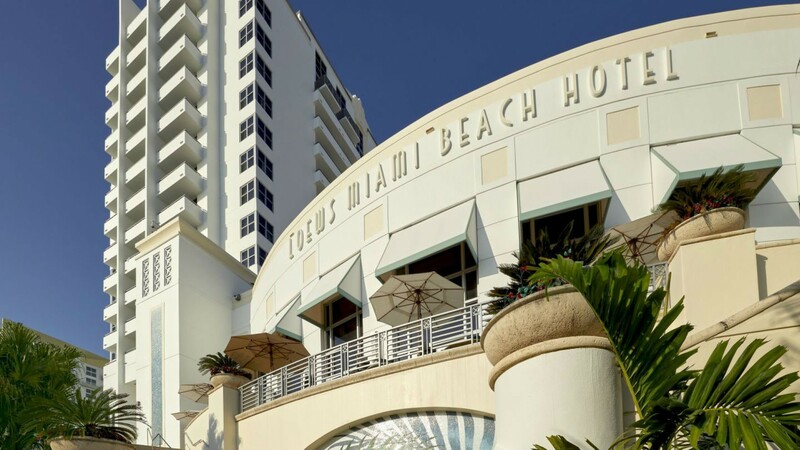 Slightly removed from the Ocean Drive strip, Loews Miami Beach Hotel offers a quiet elegance and a family-friendly atmosphere. In the lobby, guests are greeted by attentive staff and a dazzling art installation that sets the theme found throughout the hotel. Created by Sarah Raskey, the 11-foot mineral wall installation is encrusted with crystals, pearls, meteorite and precious stones, all shimmering in the bright space. Marbled concierge desks, carpets and artwork all play on the crystalline motif. Updated during the renovation, the hotel’s 790 guestrooms and suites are spacious and bright. Wood floors, art pieces and marble bathrooms add to the luxurious feel. A Keurig coffee maker, minibar, Smart TV and free wifi are available in every room. Guests can choose between city view, ocean view and balcony options. A texting service allows you to ask for fresh towels, ice or anything else you might fancy, without having to leave the comfort of your room – or interact with another human. 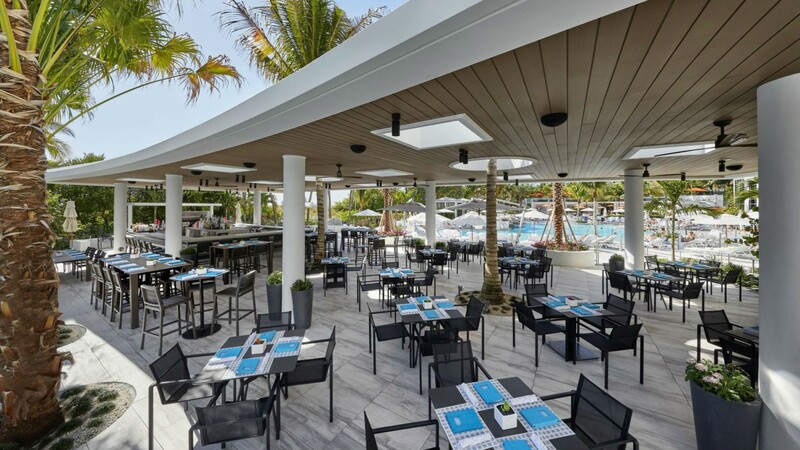 As the host of the Food Network and Cooking Channel’s annual South Beach Wine & Food Festival, it’s not surprising that this hotel has a great dining scene. 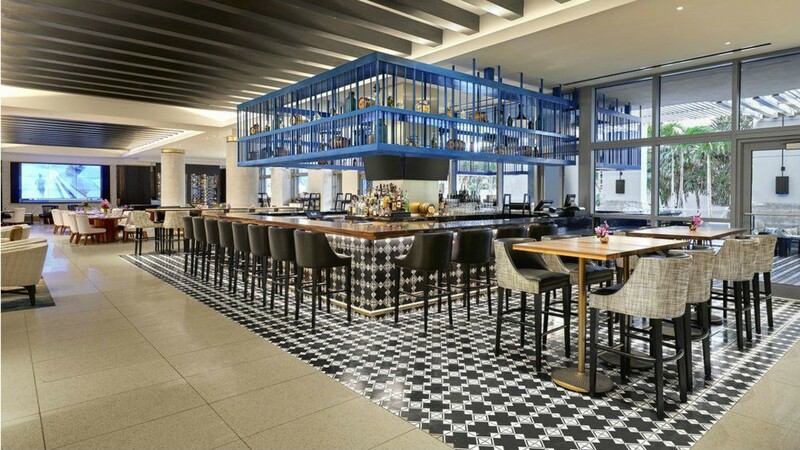 Loews Miami Beach Hotel partners with 15 local food and beverage artisans to serve craft beer, coffee, ice cream and other favourites from Miami-based purveyors. Start your day with java from Miami Joe Coffee Co., dine poolside at Nautilus, then grab a casual bite or just a delicious cocktail at Bar Collins, all without leaving the hotel grounds. 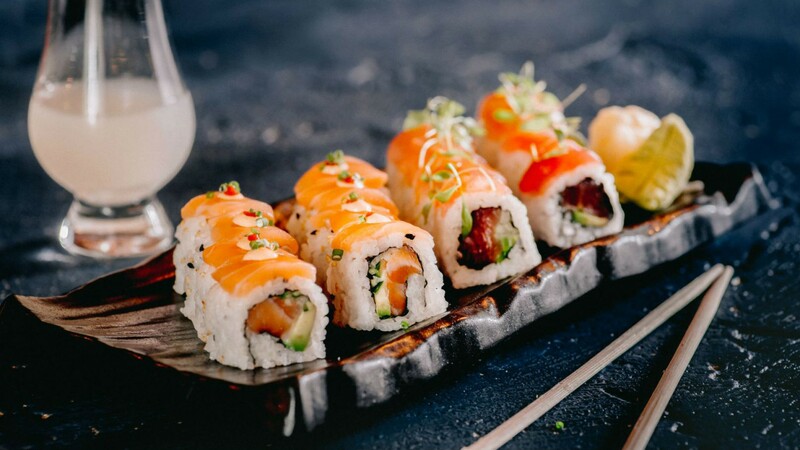 For more refined dining, enjoy sushi and seafood at the award-winning Lure Fishbar. Among the other additions brought by the renovation, Loews Miami Beach Hotel features a brand new pool deck and jacuzzi. 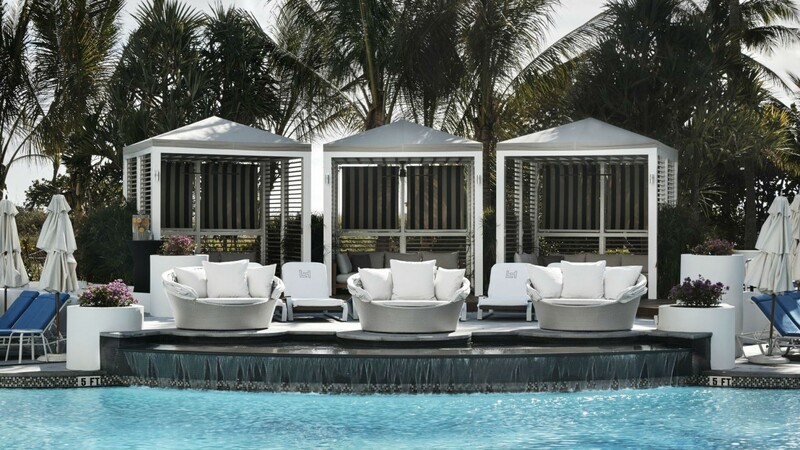 Private daybeds and cabanas can be reserved for luxurious poolside food and drink service and other special amenities. The oceanfront property also has direct access to the beach with lounge chairs available for hotel guests – along with kayaks, paddle boards and boogie boards. 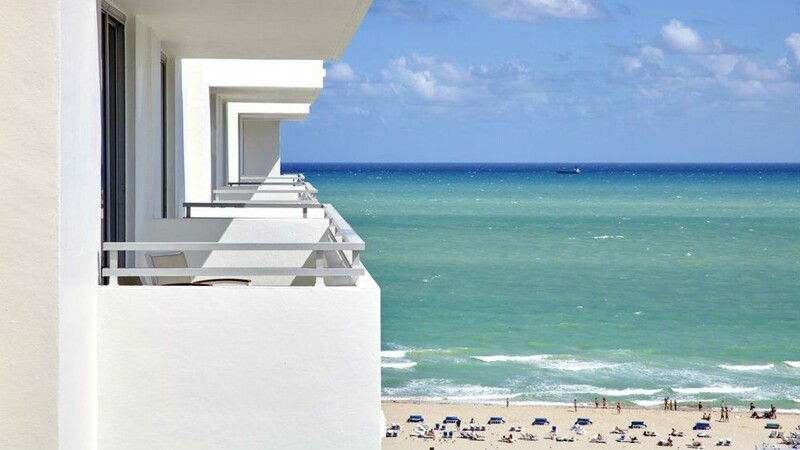 Perfectly situated just a five-minute walk from Ocean Drive, Loews Miami Beach Hotel is close enough to the action without being caught up in the chaos. Dotted with bright lights and neon signs, the strip is home to a wide selection of bars, restaurants and hotels. Walk south along the beach for views of the ocean and Lummus Park or along the street to see landmarks like the Villa Casa Casuarina – once the home of Gianni Versace. North of the hotel, Lincoln Road features a row of stores along with even more options for dining and drinking.